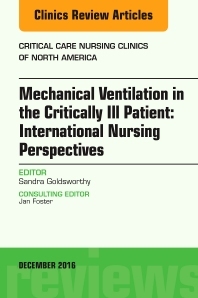 Dr. Goldsworthy has created a state-of-the-art issue that emphasizes the nurse's role in mechanical ventilation. Pertinent clinical topics include the following: basics of mechanical ventilation for nurses; current modes for mechanical ventilation; best practices for managing pain, sedation, and delirium in the mechanically ventilated patient; mobilization of and optimal oxygenation for the mechanicaly ventilated patient; managing complications; and effective weaning strategies. Authors also address mechanical ventilation in both children and neonates. The current content in this issue will leave nurses with the clinical information they need to effectively manage mechanically ventilated patients. Associate Dean Teaching-Learning and Technology; Associate Professor Research Professorship in Simulation Faculty of Nursing University of Calgary, Calgary, AB.